Besides Romney and his coterie of angry white talk show hosts, it's George W. Bush. Romneytron mimicked Bush at every turn. He ran as a CEO, appealing to the same stubborn acolytes. 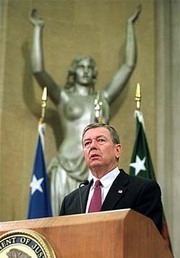 He criticized McCain for criticizing Bush. He preached to the choir. And while conservatives nationwide opted for The Anchorman -- by a slim margin -- Republicans as a whole chose the anti-Bush candidate (notwithstanding some regrettable pandering by McCain). Listening to Bob Costas' radio show tonight, I heard the most agonizing twist of fate involving our current president and baseball's ineffectual commissioner, Bud Selig. Guest Fay Vincent -- baseball's former top dog -- relayed a story about how George W. wanted to succeed him as commish. Selig had apparently told Bush he would support his candidacy, but Vincent warned him not to trust the former used car salesman. Bush, who was then a general partner with the Texas Rangers, gave Selig a deadline because he was interested in running for governor. According to Vincent, Barbara Bush had tried to persuade him not to take on Ann Richards, who was considered a formidable incumbent. 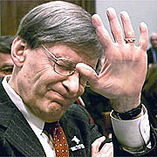 Vincent was right about Selig, who wanted the job for himself. And Barbara Bush was wrong about Richards. Think how history would've been different had Bush 43 -- a true fan -- become baseball commissioner. The game, and the country, would've been much better off. In 1937, the playwright Maxwell Anderson wrote of President George Washington: There are some men who lift the age they inhabit, til all men walk on higher ground in their lifetime. Mr. President, you are such a man. Whatever Kool-Aid they're drinking must be laced with copious amounts of booze. I promised I wouldn't discuss her (initials HRC) today, and by and large I'm sticking to my word. Actually, this post sort of defends her -- sort of. While she's been savaged for planting questions, the person whose name I vowed not to mention has nothing on the Bush White House, which never met an event it didn't orchestrate. To help make its case, the White House recruits people such as Mark Darr, 31, an insurance agent from Benton, Ark., who joined the president on stage at a forum in Little Rock last month. In a subsequent interview, Darr said he believes he was chosen because he went to college with one son of Republican Gov. Mike Huckabee and provided insurance for another. After the governor's office called, Darr said, he began receiving one call after another from the White House, quizzing him on his thoughts on Social Security and his family history, just as they did all the other candidates. "I'm sure they wanted to . . . make sure they weren't going to embarrass the president," Darr said. Not so his mother. At first when he mentioned that she receives Social Security, he said, White House aides seemed eager to add her to the panel. Then they called her. "She wasn't really for the private accounts, so they didn't decide to use her," Darr said. I trust everyone's sick of being used.